This Healthy Fruit Salad Recipe with Easy Yogurt Glaze is sponsored by Wallaby Organic Greek Yogurt and Kefir. All opinions are my own. While fall is fast approaching, I am not quite ready to give up the bounty of summer fruit still available in the grocery store. Sure, pumpkin spice is nice but the crunch of fresh fruit is absolutely delicious! 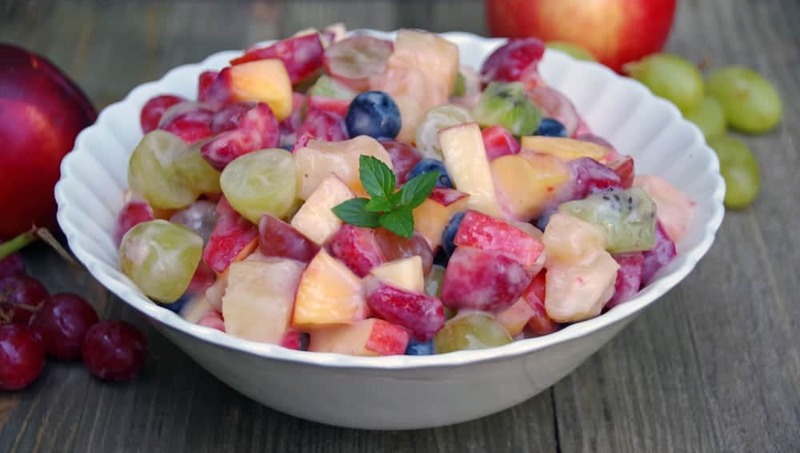 A big bowl of fruit salad makes a healthy snack and is a great addition to just about any get together that involves food. The easy yogurt glaze using Wallaby Organic Aussie Style yogurt was a tasty addition to this healthy fruit salad recipe! Yogurt Glaze for Fruit is So Creamy! Okay, so, I have never made this easy yogurt glaze before but the idea was absolutely fabulous. Basically, you take fruit juice and honey. Thicken it with corn start in a small saucepan. 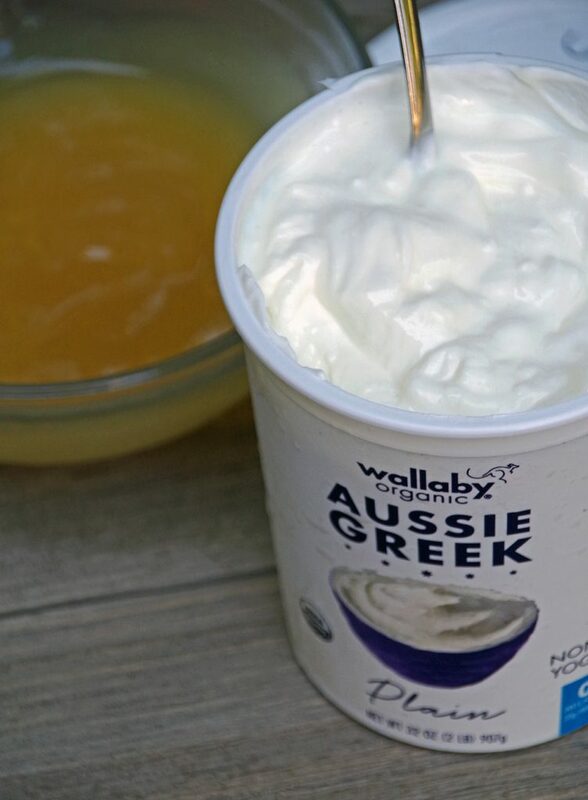 Once it cools, you add in some creamy Wallaby Aussie Style Greek Yogurt. Voila! 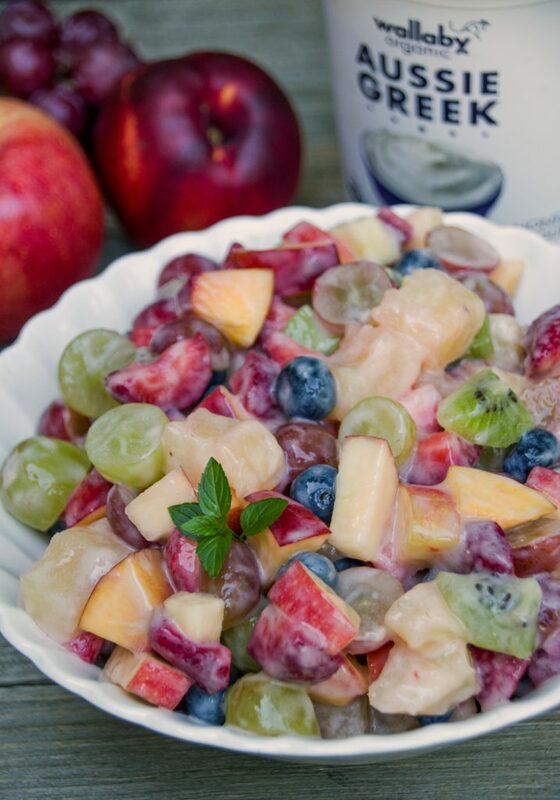 You have a creamy, all natural fruit glaze to drizzle over your fruit salad recipe! Why Choose Wallaby Aussie Greek? Okay, I will tell you right now that I am very picky about my yogurt. Wallaby is a brand I have been buying for years and absolutely love. If you haven’t tried it, check your local Whole Foods for a wide variety of yogurt and kefir products. Download a Wallaby Yogurt Coupon HERE! 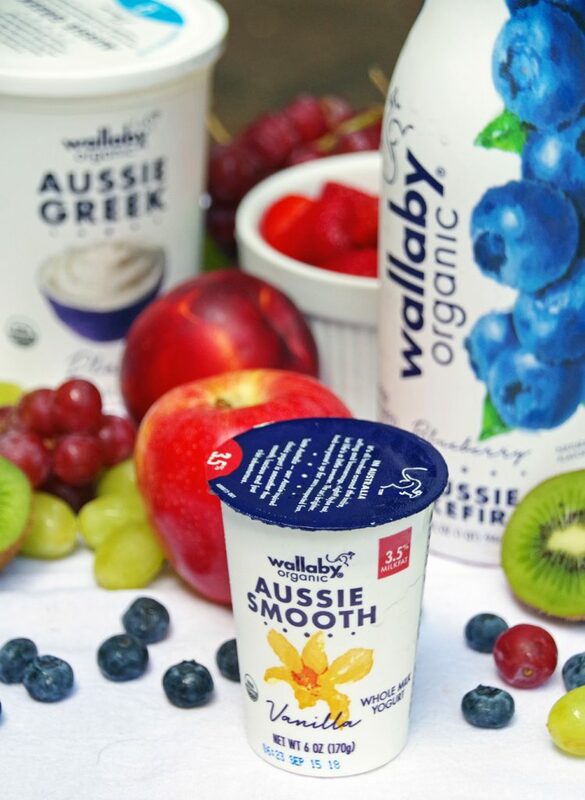 Wallaby Organic Aussie Style Greek Yogurt and Kefir are slow crafted using an Australian-inspired organic recipe. It has a uniquely mellow, delightful taste that I really enjoy. They have a simple slow culturing process takes twice as long, creating a tart free indulgent taste that’s twice as good. If you are looking for the ultimate slow food experience, I definitely encourage you to sit back and enjoy a moment or two with Wallaby! 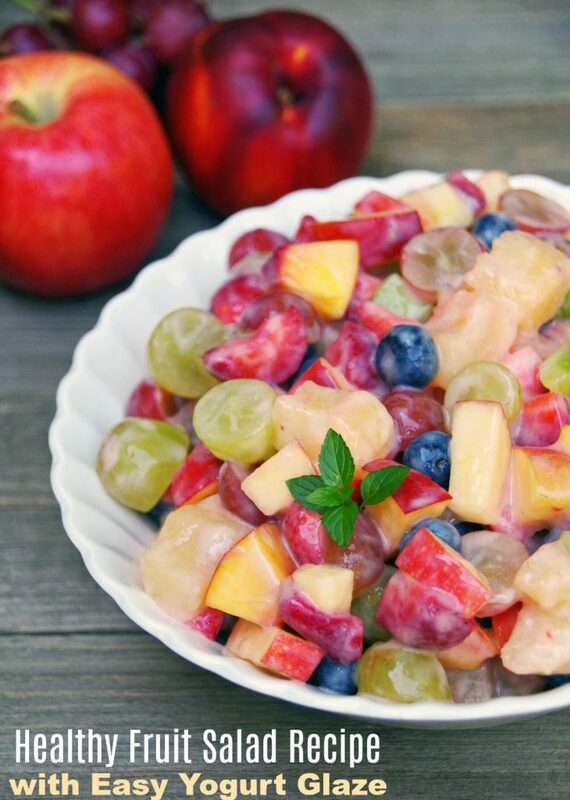 Which fruits are best for your homemade fruit salad recipe? That totally depends on what you find on sale! You will need anywhere from 4 to 6 cups of fresh fruit for this recipe. I went with nectarines, apples, green and red grapes, blueberries, strawberries, kiwi and canned pineapple. Why canned pineapple instead of fresh? because the pineapple juice from the can is what you make the honey yogurt glaze with! My one tip for making fruit salad with a yogurt glaze is to only add the glaze to the amount of fruit you are going to eat right then and there. As it sits, it becomes a bit watered down from the juice being given off from the fruit. It will still be delicious, but just not as creamy. Make up the easy yogurt glaze and put it in a glass mason jar in the fridge. Then, scoop out your healthy fruit salad into a bowl and add the desired amount of glaze. Both the fruit salad and the glaze should last for several days in the refrigerator. There is nothing artificial and no added sugar in this glaze recipe. 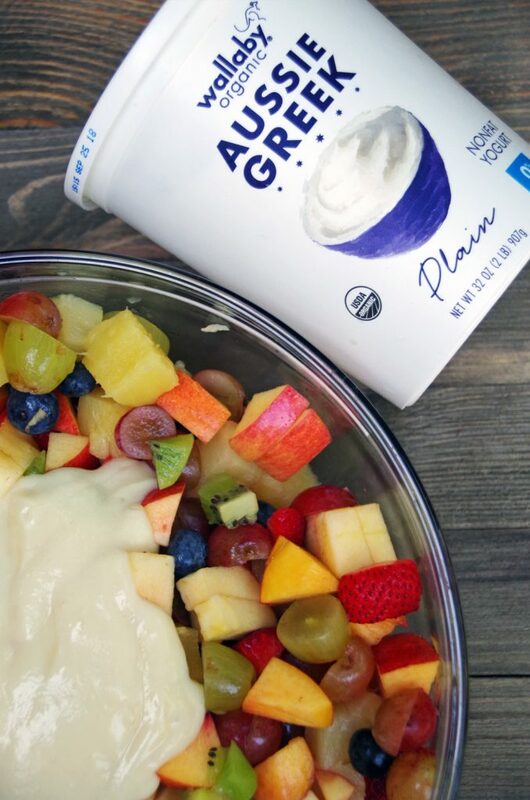 Even if you are following a super health conscious diet, this healthy yogurt glaze is a delicious way to add a creamy texture to your fruit salad. Nothing but fruit juice, honey, and delicious Wallaby yogurt! Chop fruit into bite sized pieces. I chose nectarines, apples, green and red grapes, blueberries, strawberries, kiwi and the canned pineapple. Combine the juice from the canned pineapple with the honey and cornstarch in a small sauce pan. Whisk until blended. Cook over medium heat until mixture simmers. Then cook another minute or two until sauce is thickened. Remove from heat and let cool. Mix in the yogurt and whisk until smooth. 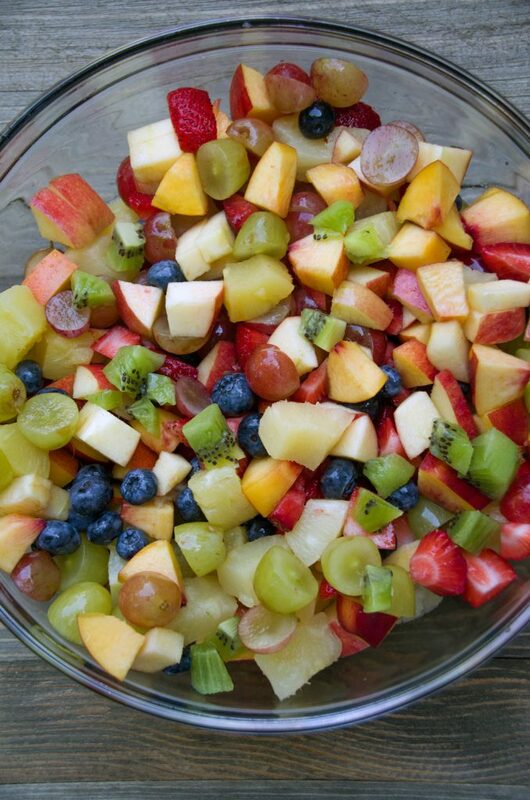 Pour the glaze over the fruit salad and mix until combined.